National Defense Minister Hulusi Akar speaks at a panel organized by Turkey's leading state-owned defense company ASELSAN, Feb. 5, 2019. Turkish officials said Tuesday the enhancing defense industry with domestically developed military equipment and vehicles has been contributing to the country's economy and increasing the deterrent power of the Turkish military. 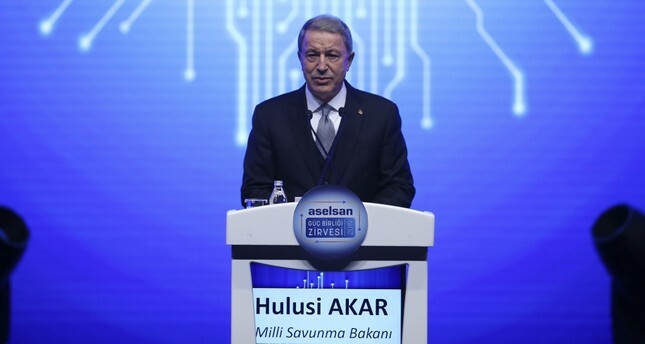 Speaking at a panel organized by ASELSAN, Turkey's leading state-owned company in the defense industry, National Defense Minister Hulusi Akar said indigenousness and domestic production are vital for Turkish firms to ascend to the top ranks in the sector. "Also, if a country's defense capabilities are not derived from its own resources, you cannot maintain national security to the full extent," Akar said. "Also, if a country's defense capabilities are not derived from its own resources, you cannot maintain national security to the full extent," National Defense Minister Akar said. In recent years, Turkey took a noticeable leap forward with innovative engineering moves in the defense industry and domestically-developed military equipment and combat vehicles in almost all fields of warfare, most notably the Altay Main Battle Tank, the ATAK T-129 Tactical Attack and Reconnaissance Helicopter and the ANKA unmanned aerial vehicle as well as other air and land platforms developed by Turkey's leading private defense companies, primarily the TB2 Bayraktar developed and manufactured by Baykar Makina. Pointing out that some Turkish companies have entered top 100 defense industry firms worldwide, Akar said Turkey's own sufficiency rates have almost reached 70 percent; while Turkish defense and aviation industry exports have surpassed $2 billion last year. According to Turkish Exporters Assembly (TİM) data, the export performance of the sector in 2018 increased by 17 percent compared to 2017. The industry broke its own record of $1.7 billion in November and moved the record up to $2.03 billion by the end of the year. The defense and aerospace industry, whose export performance has been hovering between $1.5 billion and $2 billion, exceeded the threshold of $2 billion for the first time. In addition to increased exports, the sector has also significantly diversified the markets to which it exports. Ankara recently inked noteworthy defense deals with various countries including Pakistan and Ukraine. In May 2017, Turkish and Pakistani defense companies struck a deal for the construction of four Turkish Ada class MİLGEM (National Ship) corvettes. The project, a first between Pakistan and Turkey in terms of the construction of military vessels, stands out as an exemplary and original cooperation in the field of defense and shipbuilding. Also, last month, Turkey and Ukraine signed an agreement on the purchase of 12 Turkish Bayraktar Tactical Block 2 (TB2) unmanned aerial vehicles for the Ukrainian army. Defense Industries President İsmail Demir stressed in his speech that an enhanced defense industry strengthens Turkey's hand on the ground against national security threats. "However, we have a lot more work to be done. We should continue by gradually setting our goals higher," he stressed. The more national military brought with it the ability to meddle more in regional policy-making for crucial issues for Ankara. The developments reflected the country's reshaped foreign policy, which embraces a more intimidating stance toward national threats. Turkey launched two cross-border operations into Syria, Operation Euphrates Shield and Operation Olive Branch, in the last three years with the aim of eradicating the threat posed by terror groups on its southern borders, including Daesh and the PKK's Syrian offshoots. ASELSAN CEO Haluk Görgün said at the meeting that the company's main objective is not only to grow but rather growing together with their partner and supplier firms. "The most important matter for a strong Turkey is reducing dependence on foreign technologies by acting together with all stakeholders for innovative and reliable solutions to strengthen our national defense industry," Görgün added. As well as providing for the needs of the Turkish military and aiming to expand footholds in the overseas markets to ensure sustainable growth, the Turkish defense industry has made a productive start in 2019 with January export figures. As a result of the development of the Turkish defense and aerospace industry, the platforms, systems and products are in demand around the world. The sectoral actors, striving to expand their trade volume with the existing markets, are also aiming to add new destinations. As a result of these efforts, the value of defense exports has seen gradual increases. According to the data of the Turkish Exporters Assembly, defense exports were recorded at $2.03 billion last year and maintained the rising trend in the first month of this year. The exports of the industry rose to $175 million in January, registering a 64.4 percent rise compared to the same period of last year when the sector's sales to overseas markets totaled $106.5 million. Following the shipping and yacht industry and the jewelry sector, seeing 116.2 percent and 93.8 percent increases respectively, the defense industry came third in the list of sectors that registered the highest rise in exports last month. The 12-month defense exports reached $2.1 billion. The U.S. was the top destination for Turkish defense exports, and the sector's sales to the country soared by 41 percent, reaching $64.2 million. The U.S. was followed by Oman with $49.4 million and Germany came third in the list with $18.4 million. Defense exports to Germany rose by 25 percent in January. Turkey also exported defense products to the countries that were not on the list in January 2018. These countries include Guatemala, India, Guiana, Tanzania, Trinidad and Tobago.